This recording is the latest installment in a Shostakovich cycle featuring Nelsons and the Boston Symphony. Earlier recordings in the set won in the same category in the 2016 and 2017 Grammys. Additionally, this recording was awarded Best Engineered Album, Classical (Shawn Murphy and Nick Squire, engineers; Tim Martyn, mastering engineer). Symphony No. 11, subtitled The Year 1905 in reference to the revolutionary social unrest that spread through the Russian Empire that year, was written in 1957 following the Soviet invasion of Hungary. Amid the haunting political undercurrents of this four-movement work you’ll hear echoes of Mahler. The music of contemporary American composer Mason Bates (b. 1977) mixes electronic sounds with the traditional orchestra. This can be heard in Bates’ 2017 one-act opera, jointly commissioned by Santa Fe Opera, Seattle Opera, San Francisco Opera, the Jacobs School of Music at Indiana University. can illuminate the interior thoughts of different characters simultaneously through the juxtaposition of individual themes. That makes it an ideal medium to explore a man who revolutionized how we communicate. The work of American avant-garde composer Laurie Anderson blends performance art, film, and electronic sounds. The 70-minute, atmospheric multimedia piece, Landfall, was written in 2012 in the aftermath of Hurricane Sandy. 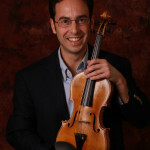 In addition to Aaron Jay Kernis’ Violin Concerto, this album includes a newly-written Violin Concerto by film composer James Newton Howard (with the Detroit Symphony Orchestra) and Bramwell Tovey’s Stream of Limelight.